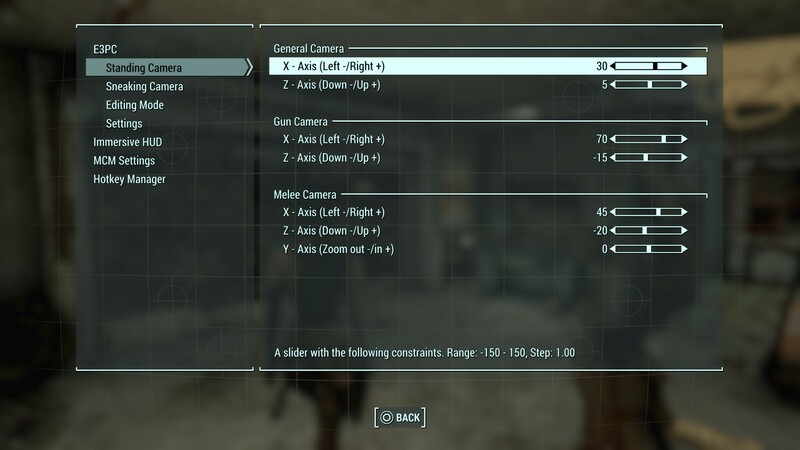 Customise the camera positioning in and out of combat, which is dependant on your stance and weapon choice, for a more unique and immersive experience. Including Shoulder Swapping Toggle and Real-time Camera Editor. Added aiming detection to disable the 3rd person camera updating whilst aiming in 3rd person. I've reworked my famous E3PC from Skyrim to fit into the Fallout 4 updated papyrus scripts and framework whilst using the ease of MCM. So it has been fully redone from scratch with extensive testing and a new way to update the camera seamlessly without causing stuttering or affecting animations, and a live editing mode to get that perfect angle before fighting off raiders and ghouls. 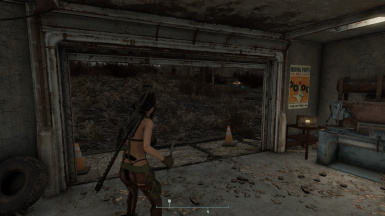 Do note this mod does require you to have bApplyCameraNodeAnimations=0 under the [Camera] section in either Fallout4.ini / Fallout4Custom.ini under %UserProfile%\Documents\My Games\Fallout4 . (You can copy paste that path to find the config file) For more information please see the stickied comment under the comments section. Allows you to define which settings you are wanting for the standing weapons sheathed. 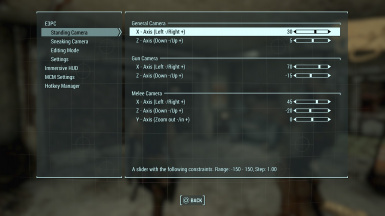 Allows you to define which settings you are wanting for the standing gun-weapon drawn. Allows you to define which settings you are wanting for the standing melee-weapon drawn. 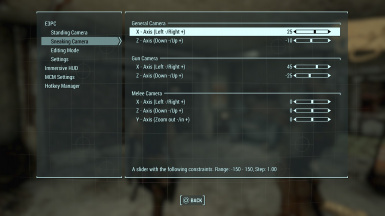 Allows you to define which settings you are wanting for the sneaking weapons sheathed. 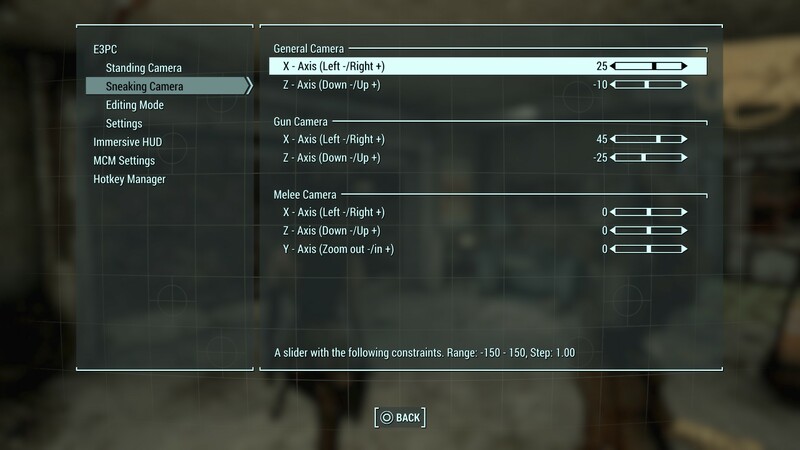 Allows you to define which settings you are wanting for the sneaking gun-weapon drawn. Allows you to define which settings you are wanting for the sneaking melee-weapon drawn. 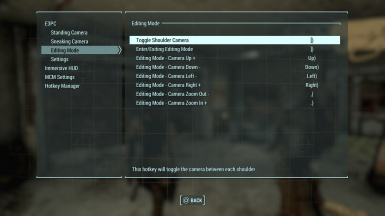 In this section you can set the key binding associated to anything that edit's the camera whilst playing the game. 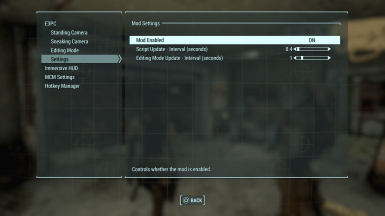 The settings you see are my default key's but you will need to bind them yourself once the mod is activated. 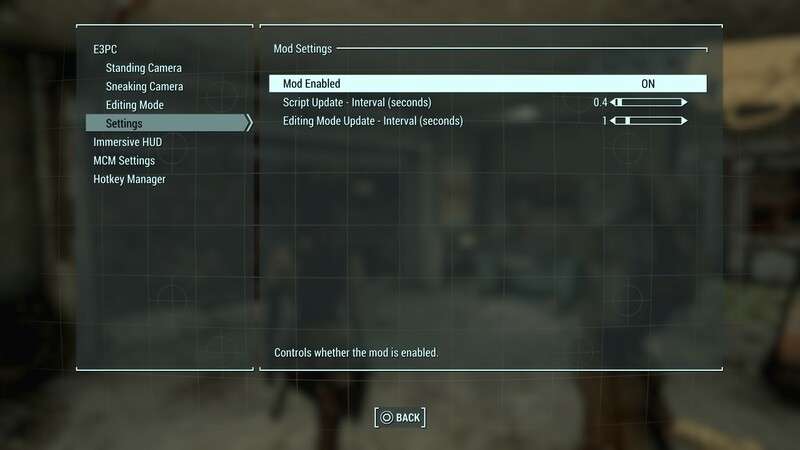 Enable/Disable the mod - When enabled it will update every X seconds, based on the script update interval for camera changes whilst doing normal game play and by the editing mode update interval whislt in the editing mode, but will ONLY be triggered when an event is detected. I have done as much as I can to do checks based on events, and then to limit how often the camera is updated with F4SE. So it will only be triggered when necessary. If you decide to disable it, then it will cancel any timer events until you turn it back on, so it is fully disabled and not taking up scripting time. Script update interval - this is how many seconds for the timer to trigger a condition based update. It will only trigger a camera update when the weapon is changed or a stance change is detected, otherwise it will register for the next update. Editing mode update interval - same as above, however it will be triggered every X seconds to show you a real time representation as you are editing the camera. This is a higher value so the camera isn't updated too often, as it will be triggered on each timer event. This is simply, you press a button that is rebindable in the option menu, and it'll switch the view to the other shoulder in real-time. This mode is abit more complex, when entering the mode it will trigger the camera to be updated on each timer event so avoid using during combat and only in a safe place, it is easy to exit the mode just press the button that is binded in the options menu. 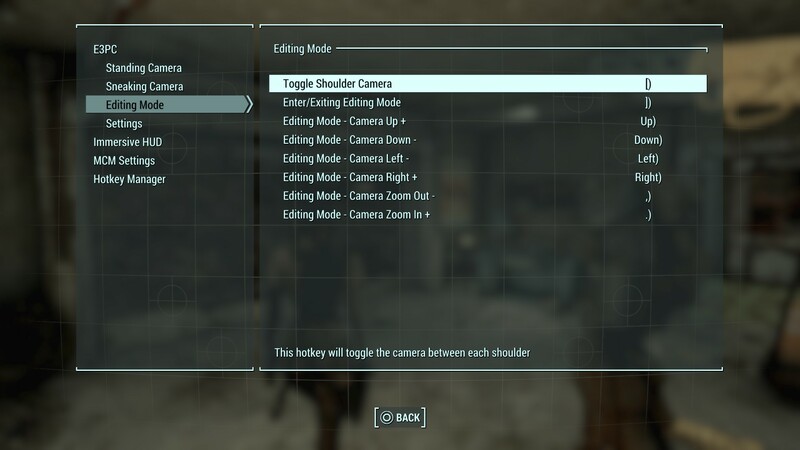 Everything is saved as you edit the camera, also each different stance/camera mode is auto detected as you go between them. Each option has a corresponding XZY values (normal camera only has XZ as the vanity camera controls the zoom, usually changeable by holding the F key). In the MCM, I have allowed upto 150 max each way, with 1 step increments. I have used these as for awhile now and I felt these would be more than enough without hindering play. Latest Fallout Patch (1.10.130), Latest F4SE (0.6.15) and MCM (1.36) will be needed. If you do not have these requirements, please do NOT install this mod, or do so but I will not support it. Simple download with your favourite Mod Manager and let it do the work, or alteratively just dump it in the Fallout 4 folder as I have already set it up properly in the file hierarchy. Load order shouldn't matter too much as it doesn't require on any other esps. When loading into the game, the MCM menu will initialize the mod and you will see a notification to let you know the mod has been activated. I've provided an option to to disable the mod within the menu, which will cause any running timers to stop until you re-enable it again or you can remove it. There are no issues that I am aware of whilst testing each section as it was implemented. Please do not distribute any of these files anywhere else, I want this to stay on the Nexus only. If you would like to use any of the code, then please get in touch with me before hand. Bethesda Game Studios for such an amazing game. Nexus mods for hosting mod. Topeira for the idea of such a mod. F4SE team for making this mod possible. MCM team for the MCM menu. And thank you for reading this far and reading until the end!